Marc Flandreau is a French economic and financial historian. He teaches at the Graduate Institute of International and Development Studies, Geneva and currently researches the early history of U.S. rating agencies and foreign government debt crises and restructuration in nineteenth-century London. As is widely recognized now (even by Greenspan himself!) the fabrication of the subprime crisis rested on an ill-conceived use of this formula. With the help of rating agencies who assisted in the process by assessing the risk of mortgage defaults, investment banks spent the first years of the 2000s frantically “structuring” new securities. The miracle was that even bad mortgages could be turned into good ones, for one bad mortgage plus one insurance policy equals one good mortgage. Risk was sliced and split and shoved to insurers such as the American Insurance Group (AIG). At the other end of the rope, where money-market managers and risk-constrained institutional investors gorged themselves on reputedly purified mortgage securities, it looked as safe as a T-bill but yielded more. When the real estate market was building momentum during the 2000s this looked like a free lunch and insurers could pocket the insurance premium without ever being called in to make up for losses. However, when the market reversed in 2006, the payday came: some insurers lost heavily, others went bust, and a few, such as AIG, were bailed out. Supply of credit insurance collapsed as the risks were being “re-priced.” The market for structured products contracted. Insurance became extremely difficult to secure leading to a massive stampede out of anything risky. By the end of the cycle, we had learned about the pro-cyclical nature of ratings-based structured products and the dangers of the new food chain. Hedge fund manager George Soros called Credit Default Swaps “weapons of mass destruction.” We had, many believed, been defeated by novelty. Maybaum was so enthusiastic with his “discovery” that, as he would do later for both the writing and adding machine in 1903 and for the revolutionary buckle in 1908, he patented it in 1891, enabling us to know the details.6 As for many innovators, Maybaum’s ideas were actually “in the air” at the time the invention occurred.7 There is evidence of a “securities insurance” hedge fund created in London in the late 1880s for a similar purpose. This hedge fund—or in the language of the time, “investment trust”—sold customers insurance against the volatility of security prices, but it soon went out of business.8 Later evidence also suggests that during the 1890s, the London Lloyd’s created a system of credit insurance that was not unlike the idea articulated by Maybaum. But sources indicate that the British variant was more limited and much less developed than its U.S. counterpart, perhaps even partly involuntary, and it was soon rolled back.9 There was also a unique feature of Maybaum’s invention: he wanted to rely on grades given by precursors of rating agencies then known as Mercantile agencies—because, yes, there were also already rating agencies. Maybaum’s patent was assigned to the United States Credit System Company (USCSC) of Newark, New Jersey, of which he was the actuary and which had started operating in 1889.12 The Company’s pioneering role in ratings-based credit insurance is confirmed by one Frederick B. Goddard, a contemporary writer, who in 1892 described the USCSC as the pioneer of a “novel and interesting system for indemnifying business men against excess losses from bad debts.”13 Since the USCSC moved into this field of business, he argued, “several organizations, conducted substantially upon the same plan, have entered the field as Credit Indemnity or Guarantee Company.”14 There was at least one other such firm, the American Credit Indemnity Company of New York, which tied its contracts to Bradstreet’s ratings (Bradstreet was a forerunner of the modern corporate rating firm Dun & Bradstreet).15 There were even two lawsuits that pitted the USCSC against the American Credit Indemnity Company in 1892 and 1893, the former accusing the latter of patent infringement.16 Ostensibly, ownership of the first weapon of mass destruction was worth fighting for. Source: Data from a variety of State Insurance Commissioners’ Reports. Goddard had seen the writing on the wall and the problem with Levy Maybaum’s invention. And Goddard turned out to be right, as data on the American Credit Indemnity Company shows. Thanks to the Insurance Commissioners of Maryland, North Carolina, and Maine, who all insisted on reporting on the American Credit Indemnity Company because it had activity in their state, we have evidence on the American Credit Indemnity Company’s performance during the pre-First World War business cycle, and it conforms to Goddard’s predictions. First, during the boom of the early 1900s, the company was very profitable. 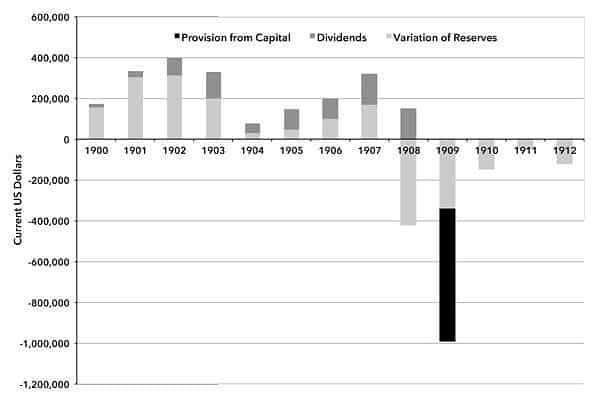 This is natural, because if premia were computed on the basis of the 1890s when default rates had been high, then improvement in the business cycle was bound to generate large revenues: less claims would be paid out of more money.21 Indeed, between 1900 and 1907, the American Credit Indemnity Company distributed annual dividends ranging between 9 and 15 percent. Seeing higher profitability it also increased its capital, supplied even more policies, and made even more money. However, in the last months of 1907 one of the most violent crises in U.S. history struck, and during the following year failures increased dramatically. In 1908, payment of claims insured by the Company exploded and the accounts showed a loss. In 1909 it was even worse (this was the year Maybaum died of heart failure, although it seems he was no longer associated with the USCSC, which seems to have left this business by then). Failures on insured debts were so large that the American Credit Indemnity Company wrote off two-thirds of its capital. To survive, the American Credit Indemnity Company also reduced its exposure: outstanding contracts in 1912–1913 were about half the amount for 1907 and the numbers kept falling.22 The Company painfully unwound positions and muddled through: consistent with Goddard’s prediction that post-crisis losses would largely offset pre-crisis gains, at the end of the cycle the Company just broke even. Recently, we have read a lot about “new,” “scientific” methods to produce “complex” products. But nothing can be less new than novelty: Levy Maybaum had already patented the CDS idea in 1891. A sales pitch splashed by one credit insurer in newspapers boasted in the early 1920s that, “There is a scientific, tried-and-proved method for limiting your credit losses! !”24 In fact, this sort of display of technological enthusiasm is generally seen during booms when many people in the market have a stake in promoting novelty: newness then plays into propaganda in favor of the market’s capacity to foster innovation. But no one needs to be fooled, and decision makers less than anybody else. Illustrating this possibility, we have the skepticism of the Northern District of Illinois Judge who had to decide on the patent infringement lawsuit brought by the USCSC in 1892. The judge found against them because, unlike Alan Greenspan, he could see through the veil of novelty that the basic idea was only standard statistical principles, and the rest had to do with craft in execution—something that was not and could not be part of the patent. As the judge summarized, the patent “cannot be construed to cover a business principles such as the law of averages.” As to the financial genius needed to construct a derivative, he was skeptical: “It required no inventive genius to form and plan the insurance on this basis. One is not entitled to a patent for a plan or method of business which only requires good judgment and foresight.”25 As the New York Times summarized, the default insurance contract was “not a patentable thing.”26 This judgment might not have rendered justice to the historical importance of the Maybaum insurance contract, but it had the value of shifting the focus away from the law of averages and the power of mathematics towards a more relevant part of the problem—whether these would be put to work with adequate judgment and foresight. It is an open question why, in the recent period, regulators decided financial engineering somehow substituted for judgment and foresight, when their predecessors had been wiser. For after all the American Credit Indemnity Company did survive. It not just survived the crash of 1907, but also that of 1929, and even still exists today as the Euler Hermes American Credit Indemnity Company. But AIG collapsed. To explain why, it should be remembered that the American Credit Indemnity Company was strongly capitalized, and its managers may have been more careful, intelligent, or just plain lucky than those of AIG. There is perhaps a lesson in the efforts made to increase reserves and in the statements in the USCSC’s advertising literature that they would keep a buffer equal to a multiple of the worst losses for the worst crises.27 Possibly people in this industry understood the risks then. There is perhaps a lesson in the large commissions American Credit Indemnity Company’s balance-sheets show it paid to intermediaries in an ostensible attempt to supplement rating agencies’ statistics with some insider information on what risks they ought to underwrite. It looks like early insurers took rating with more prudence than we have of late, and understood some problems that we have forgotten. One question is why this memory was lost. The lesson from the Maybaum episode is not that history does repeat itself: it is that it has gotten more vicious lately. ↩ ”Remarks by Chairman Alan Greenspan Before the Council on Foreign Relations, Washington, D.C.,” November 19, 2002, http://federalreserve.gov. ↩ There are always predecessors to predecessors. The so-called “trinnus” which banking firm Fugger sold its customers in the sixteenth century combined an investment in a security plus insurance on income from that security and on the capital invested. The result was not very different from the “mezzanine” loans in the language of mortgage lending. ↩ The combined adding and writing machine was assigned to the American Machine Cy, patent number 726959 in 1903; the new and improved buckle, patent number 894027, was filed in 1908. ↩ The March 25, 1909 New York Times, has him dying at fifty-five—but the New York Times, of May 9, 1909, has him dying at age fifty-four, and the Yale Law School Obituary has him at fifty-five and argues he was born on October 3, 1853. A sad ending in disorder for an accountant. ↩ Levy Maybaum, A plan or system for securing persons against loss in banking, fire, life and mercantile institutions and concerns (Newark, NJ: n.p., 1878).Between 1888 and 1891 he published five essays establishing the general outline of his project: A novel credit system (Newark, NJ: Doctor and Sons, Printers, 1888); A complete credit system with plans and forms necessary, etc. (Newark, NJ: n.p., circa 1889); A system and plan for the organization of a company to guarantee against loss by the failure of banks or insurance companies (Newark, NJ: W.H. Shurts, 1889); A plan or system of guaranteeing excess losses on bank discounts, etc. (n.p., 1890); and, in 1891, A Plan or system for securing merchants…against excess losses by reason of Bad Debts, from which the patent was drawn. ↩ Patent number: 465485, filing date: January 5, 1891, issue date: December 22, 1891; for a discussion, see Gregory A. Stobbs, Business Method Patents (New York: Aspen Law and Business, 2002), 240. ↩ In 1837, an early scheme was William L. Haskins’ “Guaranty Company” conceived to relieve merchants from the doldrums of the depression. See William L. Haskin’s Considerations on the Project and Institution of a Guarantee Company, on a New Plan: With Some General Views on Credit, Confidence and Currency (New York: Pelt, 1837). ↩ “Insurance of Securities,” Economist, July 30, 1892, 966–68. ↩ See Cuthbert Greig, Commercial credits and accounts collection (London: Pitman, 1932), 175ff; and D.E.W. Gibb, Lloyd’s of London (London: Macmillan, 1957). ↩ From patent: “For this purpose and in order to provide a means of ascertaining such standing or rating through instrumentalities not controlled by either of the contracting parties, I propose to adopt or specify that all of the persons payment from whom is to be guaranteed shall be persons of a given rating as to credit or capital or both in some established mercantile agency to be agreed upon.” Maybaum added further limits on the type of risks guaranteed: 1) The standing of debts insured would have to be “high or good credit rating (A or B in usual mercantile-agency phrase)” as to credit and $2,000 or higher for capital; 2) The guaranty could never be more than 20 percent of the debtor’s capital according to the “lowest amount of the agency-reported capital.” Last, the insurance would never be for the total amount of losses, but only for losses in excess of the average in the line of business to which the applicant belonged. ↩ But in practice it probably was. If we take the description of the typical contract made by the United States Credit System Company, we read that the Company did not want to get involved with the defaulters and as a result implementation of the payment of the indemnity required the insured merchant to make a certified statement of his losses. This would have made it difficult for a third, non-exposed party, to purchase such an insurance. See United States Credit System Company, Guaranteeing wholesale dealers and manufacturers against excess losses (Newark: Shurts, 1889), 12. Another aspect of the implementation is that in Maybaum’s scheme insurance was limited to the amount in excess of the usual percentage of losses in a given line of business. See ibid. ↩ Foreword and back pages of United States Credit System Company, 1889. ↩ Ibid, 138. Goddard mentions one firm that appears, from his confused explanation, to have either ignored the anti-selection problem or to have taken more speculative positions and “soon withdrew from the business.” An interesting remark in the patent by Maybaum that he had “also ascertained that in those lines of business in which there is a large percentage of average loss there is also a larger percentage of average profit” suggests that he had understood the principle upon which Michael Milken would construct his junk bonds scheme almost one century later, namely that riskier bonds tended to outperform. ↩ “Indemnity Company Sued,” New York Times, June 15, 1899. The American Credit Indemnity Co. had been created in 1893 at 309 Broadway, New York (according to reports of Insurance Commissioner of Maryland). ↩ They were brought respectively before the Northern District of Illinois and the Southern District of New York. For details see Stobbs, Business Method Patents. ↩ William Yates Chinn, The mercantile agencies against commerce (Chicago: C.H. Kerr, 1896), 241. ↩ “It is not charged, however, although an inquiry might be raised, that the brand of mercantile agencies is used in depressing credit for the purpose of giving [credit] assurers a showing…. It is understood [credit insurers and mercantile agencies are allied], or rather, one who has at the head of a mercantile agency set himself up at assuring credits based on their ratings” Chinn, Mercantile agencies, 241. ↩ “Insurance of Securities,” 967. ↩ Goddard concluded that the underdevelopment of credit guaranties owed much to the “unfavorable conditions” of their early career, but that the “large number of substantial concerns which are still their patrons shows a willingness to sustain them… There are many reasons to believe that Credit Insurance will receive the full measure of public confidence and support when…. it has passed through experimental stages…. The great, trusted and successful company of the future will be a growth or an evolution,” Goddard, Giving and getting credit, 140–43. ↩ While aggregate failure rates had stood at 111 per 10,000 concerns during the 1890s, in the early 1900s they were substantially lower (around 90 for 1900–1907). ↩ It would be tremendously interesting to know how the Indemnity Company reacted in terms of the type of risks it insured. The large expenditure that they list in accounts under “commission or brokerage” (in 1905, more than half the amount of premiums paid and about one fourth of premiums received) suggests that they originated a fair part of the contracts. ↩ Chinn, The mercantile agencies against commerce, 80. ↩ “Net Profits are Limited,” an ad for the American Credit Indemnity Co of New York, Milwaukee Sentinel, June 12, 1922, 22. ↩ Stobbs, Business Methods Patents, 245. ↩ “Not a Patentable Thing,” New York Times, January 8, 1893, http://query.nytimes.com. ↩ See E.M. Treat, Business and Failures After the War: Factors of Safety and Factors of Danger. Map Showing Record of Commodity Prices and Failures for 58 Years (New York: American Credit Indemnity Company, 1919). Treat was the president of the American Credit Indemnity Co. See also the book by the Chairman of the American Credit Indemnity Company, I. H. (Isaac Henry), Commercial crises; a discussion of the present economic situation and the origin of crises (St. Louis: The American Credit-Indemnity Company, 1920).